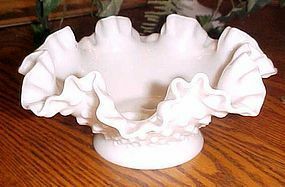 Fenton milkglass hobnail ruffled epergne base 3 holes 8.25"
Fenton bottom for the milkglass hobnail epergne. This does not include the horns, and is just for the base.Dimensions 8 1/2" wide x 3 1/2" high - ruffled top edge with 3 separate holes for the vases. This is the smaller base (the large one being 10") This is in perfect condition with no damages or repairs. 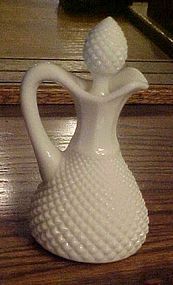 Westmoreland Glass Company White Milk Glass English Hobnail pattern 3 Oz Cruet Oil bottle w/Stopper. 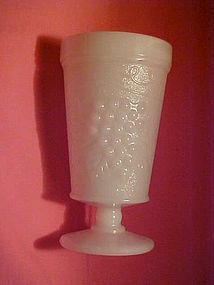 About 6 1/8" tall with stopper x 3 7/8" wide with handle. Perfect condition. No chips or cracks. What a nice item to add to your collection. 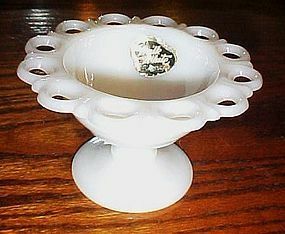 Anchor Hocking Milk Glass Small Open Lace Edge Compote or Candy Dish. 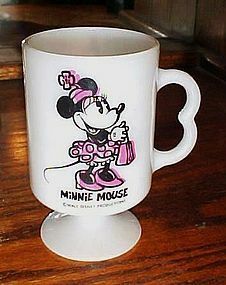 The top measures approximately 5 1/4" in diameter, the base measures approx 3" in diameter and it is approx 3" tall. This one still has the original sticker. 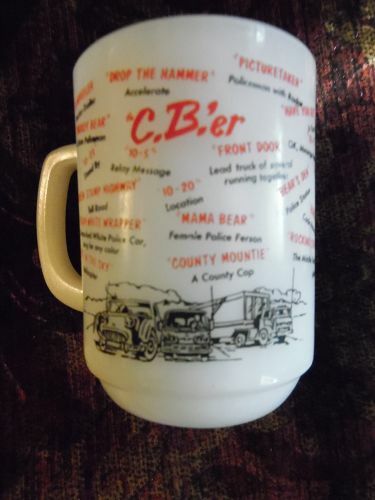 Vintage, Indiana Colony Harvest coffee cup. Measures approx 2 3/8' tall, 3 5/8 opening. I have 6 available all are in perfect condition. Price is for each cup. 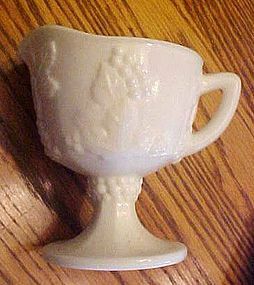 Indiana Harvest Grape Milk Glass footed creamer. Excellent condition with no damages. Made by the Indiana Glass Company. 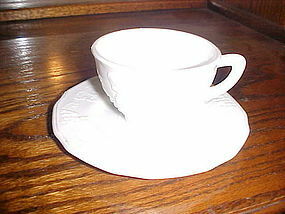 Indiana Glass Colony Harvest ( grapes pattern) milk glass cup and saucer set is in excellent condition. 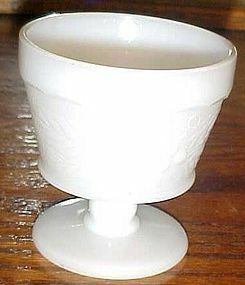 Cup is 2 3/8 inches high and 3 5/8 inches in diameter, saucer is 6 1/4 inches in diameter. I have 4 perfect sets available. 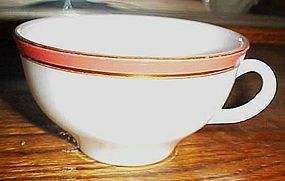 Price is for 1 cup with its saucer. Popular harvest pattern, of grapes vines and leaves. 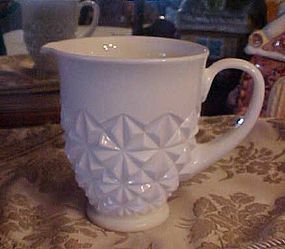 Pretty white milk glass. 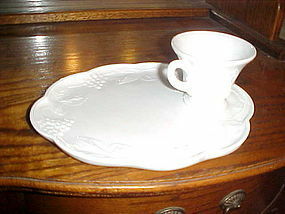 Tray measures 10 1/4" x 8 1/4" and has a saucer well. 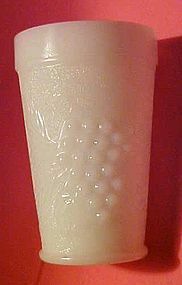 Cup is footed and has matching pattern. I have 8 sets, and all pieces are perfect. Price is for one tray with its cup. Add to your set today. I combine shipping. 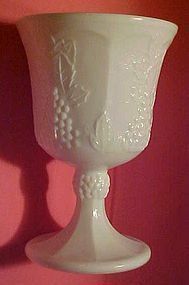 Milk Glass footed sherbert / dessert dish made by Hazel Atlas and Anchor Hocking, grape design, or harvest with grapes leaves and vines with stippled background.Dish stands 3 3/4" and measures 3 1/2" across the rim. No chips or cracks. 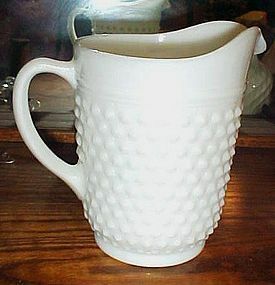 Pretty vintage milk glass pitcher with diamond pattern. Applied handblown glass handle and star pattern on the underside of the bottom. Measures 6 1/4" tall. Owner thought it was Westmoreland but I dont see their mark on it, Perfect condition though and heavy weight. 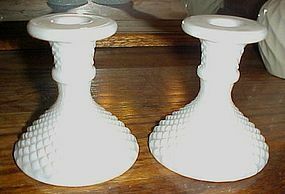 Vintage Westmoreland English Hobnail Milk Glass Pair of Single Light Candle Holders. They each measure 4" tall with a 3-3/4" base diameter and a 2-1/8" top diameter. No chips, cracks, or scratches. Excellent condition. Sold as a pair. 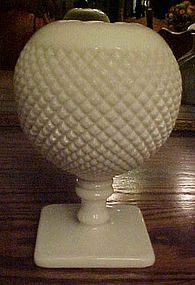 English Hobnail ivy ball vase has a crimped top and stands on a pedestal with a square foot. It stands 6.5" tall and 4.5" wide. It is in excellent condition. 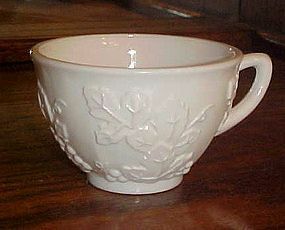 Could be used as a ferner or rose bowl, I have 2 available, price is for each.